And…. we were so LUCKY that he did! We loved the peat as it was perfectly balanced, not too heavy, none of that asphalt or ashtray peat… just salt sweat and peat in delightful harmony. In short it was sublime! We gave in to temptation… and discovered it was even better?! Bringing out a lovely earthy quality on the nose, initially so much yummy spice on the palate, then settled down to become even more enjoyable, shifting between cinnamon toast, salty toffee, simply delicious! 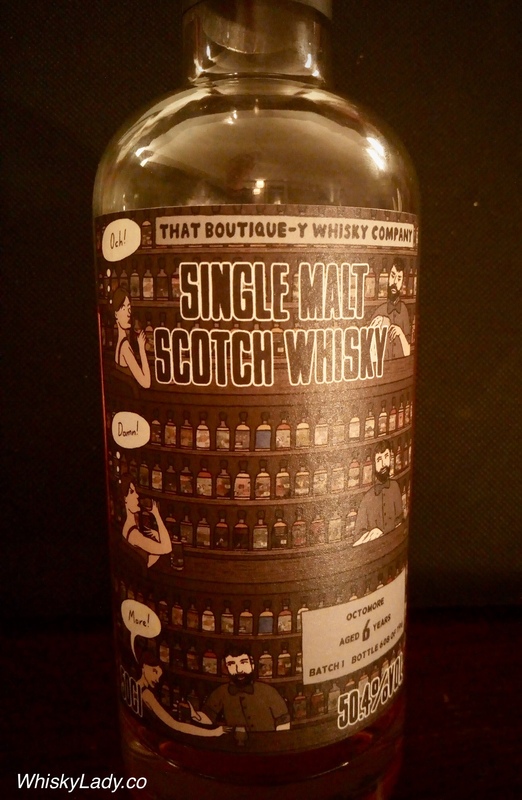 It was absolutely unanimous – we all agreed this was a brilliant dram. One to just enjoy. We ran out of words as we sat back and simply indulged, feeling exceedingly pampered. Nose: Medicinal peaty notes with polished leather. Liquorice toffees, charcoal burning smoke and sea spray. Palate: Sweet white grapes, prickly pepper, with a woody bonfire smoke and a pinch of salt. And what would this Octomore set you back for a 50 cl bottle? The recommended retail price is £144.95. What did we sample in our tribute to Jim McEwan? This entry was posted in Islay, Scotland and tagged Jim McEwan, Octomore, That Boutique-y Whisky Company by Carissa Hickling. Bookmark the permalink.